45 days female baby suffering with fever & intractable convulsions from last 4 days. systemic examination is normal.CSF analysis is normal. a figure of eight appearance of brain. Colpocephaly +. 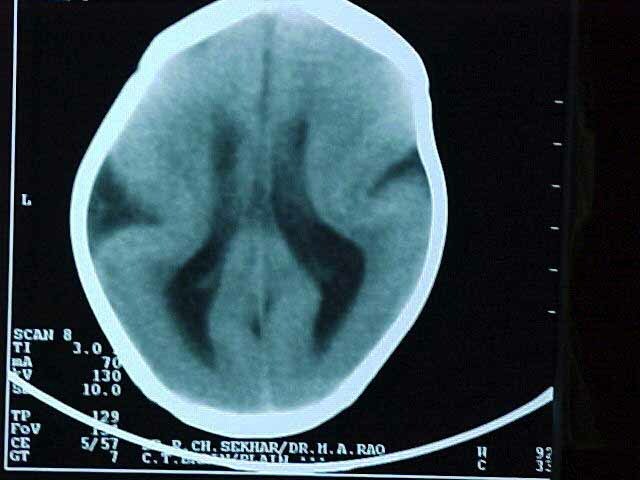 Lissencephaly or smooth brain refer to brain with absent or poor sulcation. It is physiological at 16-17 weeks of intrauterine life. Intrauterine infections can also results in asmooth, Lissencephalic -appearing brain. can be present if Lissencephaly is due intrauterine infections. Lissencephaly type 11 shows agyric, severely disorganized unlayered thick cortex with poor cortico - medullary demarcation. On MRI ,cortex is thick with poly microgyric and hypo myelination. Lissencephaly type 111 shows microcephaly ,thick cortex, enlarged ventricles and hypoplastic cerebellum & brain stem. Reference: Diagnostic neuro-radiology by ANNE G. OSBORN. Submitted by :DR. M. Adinarayana Rao. M.D. & DR. R. CHANDRA SEKHAR.M.D.